The focus for sprint racing in the UK is the National Regatta series which are run at the National Watersports Centre in Nottingham. There are usually 5 regattas a year in April, May, June, July and September usually taking place on the first or second weekend of the month. The dates can be found here. These regattas take paddlers from a minimum standard that most competent paddlers can achieve up to international standard. 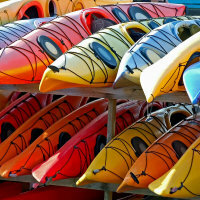 Boys and girls, men and women race in separate classes as do canoes and kayaks. Crew boat racing is very popular and there are Paddle-ability race categories for those with a variety of levels of ability to take part. A number of clubs run local regattas. This is an opportunity for paddlers to try sprinting in a less formal environment. Formats vary. Scotland has its own series of sprints as does Essex. Elmbridge, Richmond and Royal Canoe clubs usually run events serving the London area. A new event ran at Warwick for the first time in October 2014 and is scheduled to run again in 2015. Other clubs run events for their own members which others are welcome to attend. 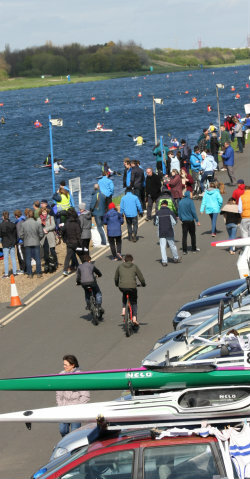 The National Regattas take place at Holme Pierrpoint in Nottingham. Each regatta takes place over the two days of a weekend with racing starting around 10am on Saturday and not finishing until well into the evening (typically 6pm). Races start again at 8:30am (worst case 8am) on Sunday and run until around 4pm ish depending on entries. Be aware if you are travelling for the day that your first race or last race could be at any of these times! Paddlers are split into classes with A being the fastest. New paddlers typically start in D classes. 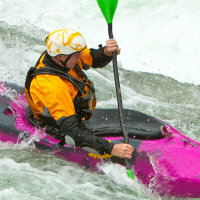 Paddlers earn promotion through the classes based on their times at races. (Paddlers who are fast enough should be entered straight into higher classes but this is relatively unusual and is likely to include those who have moved to the UK and have raced in another country or those who have transferred from another sport e.g. White Water Racing or Surf Ski Racing). Those aged under 12 race in a mini-sprint series. This series earns points for the club towards an annual trophy. If children do not have partners for doubles or K4 races individual entries can be sent in and scratch crews will be made up. 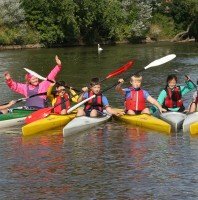 The idea of these events is to encourage these younger paddlers to enjoy racing, make friends and look forward to progressing into the older age groups as competent confident paddlers. Those aged between 12 and 18 race together in the junior classes and then move on into senior racing. For the over 35s there are the masters classes in both men and women's racing. 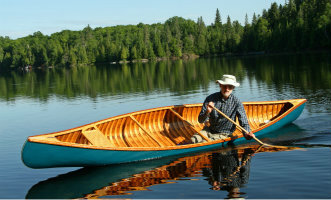 Canoe racing is not as dominant as Kayak so the number of classes are fewer. Where there are insufficient numbers canoe paddlers often race in with the girls or women's races. All canoes race together ranked into appropriate races based on speed. The National Regattas also incorporate Paracanoe and Paddleability racing. Sprint Racing in the UK takes place over 200m, 500m and 1000m with 5000m races at some events. Different classes race different distances. Those under 12 years of age on the 1st January in the year in question race in the Mini-Sprint series in Lightnings, Mini K2s and Rocket K4s. All races are over 500m. Usually singles racing is on one of the days and doubles and K4 on the other day. Juniors aged under 18 on the 1st January in the year in question start in Boys D or Girls D and race in K1 over 200m and 500m, K2 over 500m and 1000m and K4 over 500m and 1000m. If you do all those races that's 6 races. If there are heats and finals in every race that would be 12 races. This is a lot for one weekend and even 500m doesn't feel that much like a sprint when you are working hard! Minimum standards are set which paddler should be able to achieve in good conditions as set out below before they race at National Regattas. Times recorded will often be slower due to headwinds and the waves they produce. * In practice we know that there are plenty of people who have been racing at these regattas who have never done these times. What you should be is confident enough that you can compete without being left a long way behind everyone else or falling in on the start etc. In addition to meeting the time requirements you are expected to "have basic competency equivalent to BCU 2 star or Paddlepower Discovery". This is because you need to be able to look after yourself on the course, line up on the start line (which is not always easy) and generally not get into difficulty or get in anyone's way. You will need to be a member of BCU unless you are under 18. Under 18's only have to become BCU members to race in C classes or higher. Which races are held on which day? A programme sets out which events are held on which day. It is published on a blog style post on this page. the race schedule - this comes out before the event and tells you what events will run on which days. the race start list - this shows who is entered into each race and in what lane they will race. the race programme - this shows the race starts list plus other information about the regatta. Results are also shown on this page. There have been changes to these days in recent years so its best to check before making any assumptions about which day your races will be held on. As at April and May 2015 Saturday is largely 200m and 1000m racing whilst Sunday is largely 500m racing, however there are many exceptions so check up on your class, specifically. K4 events often buck the trend! Lightnings usually race singles on Saturday with mini-K2 and Rocket K4 on Sunday. Your entry has to be submitted by your club. Your club will have a team leader who does this and your coach should be able to tell you who this is. Each paddler has to be registered (see above). Your team leader needs to have entered you nearly 3 weeks in advance of the event and by the time they have compiled everyone's entries they will be asking for your entries a week before this. So you need to be organised and decide a) that you are going and b) what races you wish to do well in advance. If you have a coach they will help you decide what to enter and tell you when you are ready. Once you have entered you will be committed to paying for your entries and many clubs ask for the money to be paid in advance. Late entries can be made if spaces are available in lanes but are discouraged by hefty late entry fees (£12 per single entry, £19 for doubles, but no late fee for K4 crews). These entries are made on the Saturday morning of the regatta. You will not know where you have got an entry until about 10am when your team leader comes out of this meeting. K2 and K4 crews are often found at the team leaders meeting especially for those who have only just started racing. I've entered what else do I need to know? We suggest you read the pages about what to do before race day and on race day NOW before race day to make sure you are prepared for your first event. A historical set of results going back to 2014 are shown here. In 2014 the BCU Sprint Racing Committee started its own website and programs and results are published here. In 2014 provisional results came out over the weekend on this page as well. We expect them to appear in the same place in 2015. What can I win and how do I progress? As there are a LOT of races there are only prizes for certain events. If you are a junior you win small discs which are commonly known as "Tiddlywinks". You can buy a board to put your tiddlywinks on. These Tiddlywinks are only won for coming 1st, 2nd or 3rd in a 1st final. It might take you a while to win your first one but they are all the more worth having when you do. If you have come in the top three of a final go to the regatta office desk (ask if you don't know where this is), tell them what you have won and they will give you your Tiddlywink. They also sell the boards. 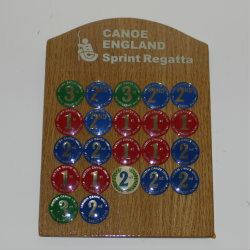 Those competing in the mini-series will be awarded a certificate at each regatta they race at as well as Tiddlywinks. Apart from this the only prizes are medals for winning National Championships. These are handed out either as you win or at a medal ceremony. If you do a fast enough time after allowing for any wind factors you will get promoted to the next class up. Winning does not necessarily mean you have a fast enough time. The times are set out here. The standards are quite high so don't expect to progress immediately but be very pleased when you do. If you do slow times you may get demoted back down the classes. If you do a slow time and there is a particular reason e.g. your rudder breaks, you slow down due to an injury ask you team leader or coach to inform the person doing demotions to make sure this is taken into account. Throughout the year each class will have a regatta which is defined as the National Championships. On this occasion instead of racing in classes based on ability / speed paddlers will race in age groups to enable everyone to compete for the National Championship titles. Juniors race based on the following classes Under18, Under16, Under14 with age being determined on 1st January in the year in question. If you are still 17 on the 1st January you are under 18 for the whole year. The National Championships will be held at the July regatta in 2015. Seniors race as Under 23 and Open and their National Championships is being held at the July regatta in 2015. Masters race as Over 34, Over 44, Over 54 and Over 64 with age again being determined on the 1st January in the year in question. So if you are 34 or over on the 1st January you will be 35 during that calender year and you compete in the Over 34s. In 2015 the Masters National Championships is at the May Regatta. Paracanoe paddlers race in their classes and their National Championships are in July in 2015. Medals are awarded for the winners of these races. Clubs compete for the honour of winning the McGregor Paddle at the annual interclub event. This is usually the September or July Regatta. In 2015 it is the September regatta. Each club scores points for its 12 best K1 results, 6 best K2 results and 3 best K4 results. These scores are added to the total number of paddlers entered with additional points for promotions during the year and deductions for any penalty points received by the club during the year. This is a great opportunity to see clubs pulling together with some unusual K4 combinations and paddlers who rarely compete brought out to try their hand at adding to the points tally. Before you Race read through this advice to make sure you take with you what you need, arrive on time and feel ready for your first time at any sprint regatta. Race Day most of us suffer from nerves on race day especially if we don't know what to expect. Read through this advice so you know more about what will happen and keep it handy so you can remind yourself what you should be doing when you arrive and as the day progresses.